Collins Aerospace, an international leader in the development and deployment of aviation technology around the world, has long been a close partner of Iowa State University, with the largest business unit residing in Cedar Rapids Iowa, the company employs more than 1,200 Iowa State alumni in offices across the United States and internationally in Australia, Europe, the Middle East, South America and Asia. Collins Aerospace—formed in 2018 with the acquisition of Rockwell Collins by UTC Aerospace Systems—supports a number of philanthropic causes related to the university, sponsors competitions, encourages employees to participate on advisory boards and other committees, and more. Until recently, Collins Aerospace did not have a physical presence in close proximity to Iowa State. With an eye toward establishing an even deeper relationship with Iowa State and the greater business community in Central Iowa, Collins Aerospace opened an office in the Iowa State University Research Park during 2018. 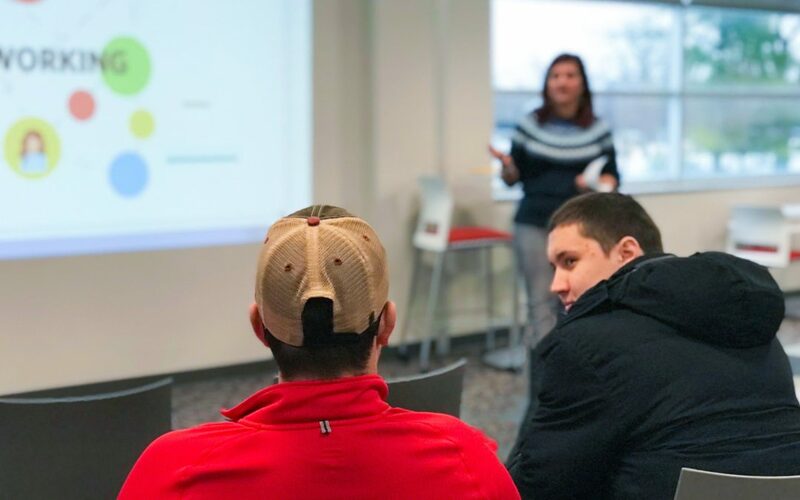 Katie Knott, an Iowa State alumna and Collins Aerospace Senior Engineering Manager, says that having the ability to work one-on-one and face-to-face with students throughout the school year is a huge benefit—to both students and the organization. “When I was an intern about 20 years ago, you took a summer or semester off from college to go to Cedar Rapids, or another Rockwell Collins location, to fully immerse yourself in work,” she says. “Then, after the 3-12 months working, you fully immersed yourself back in school. It felt disjointed on both ends. This changes that dramatically. Iowa State’s Aerospace Engineering program boasts a rich history—aeronautical engineering classes have been offered at the university since the 1920s—and it is among the top 25 of like programs in the nation. Students and graduates of the Iowa State Aerospace Engineering program, are highly sought after due to this unique distinction. Iowa State graduates a large numbers of mechanical, computer, software, and electrical engineers, all skill sets coveted by Collins Aerospace. As a leader in aviation technology, recruiting skilled employees is vital to the success of Collins Aerospace. Leadership at Collins Aerospace understands that by establishing a physical location makes accessibility to students—both undergraduates and graduates—a smart business decision. There are two opportunities that are offered from the new office: internships and co-ops. The internships are time-limited in scope, a semester or more, and offer a part-time experience. Co-ops are similar to permanent employment positions where students split time between their work and their studies. Both types of positions offer an immersive real-world experience for students, and offers Collins Aerospace access to some of the brightest new minds in the field. Etten says setting up shop in Ames is a win-win. The stage is set with the new office to greatly expand opportunities for students. The internships and co-ops available are primarily for engineering students in the aerospace, mechanical, computer and electrical disciplines. Among the projects currently being steered by teams located in the office are Flight Management Systems, GPS Development, CH-53K, 777X Fly By Wire, KC-135, FPGA, and more. Knott is the only full-time Collins Aerospace employee working out of the Ames office currently. There are a few Collins Aerospace employees who work remotely in the Ames area who use the office now and then, with almost three dozen interns using the space on a regular basis. That is a number that Knott hopes to double by next year. As Knott and Etten look to the future of the Collins Aerospace location in Ames, they are filled with optimism.